Aristopet There are 2 products. 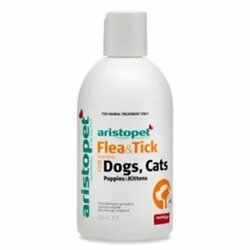 Aristopet Flea & Tick Rinse Concentrate for Dogs, Cats, Puppies & Kittens controls fleas, lice and ticks (including paralysis ticks) on dogs and cats. Prevents attachment of ticks on dogs and cats for up to 3 days. 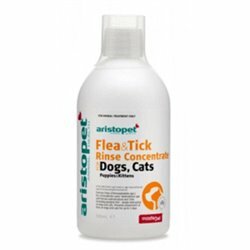 Aristopet Flea & Tick Shampoo for Dogs, Cats, Puppies & Kittens is a gentle acting insecticidal shampoo containing natural pyrethrins to control fleas and aid in the control of adult brown ticks. Does not control paralysis tick.